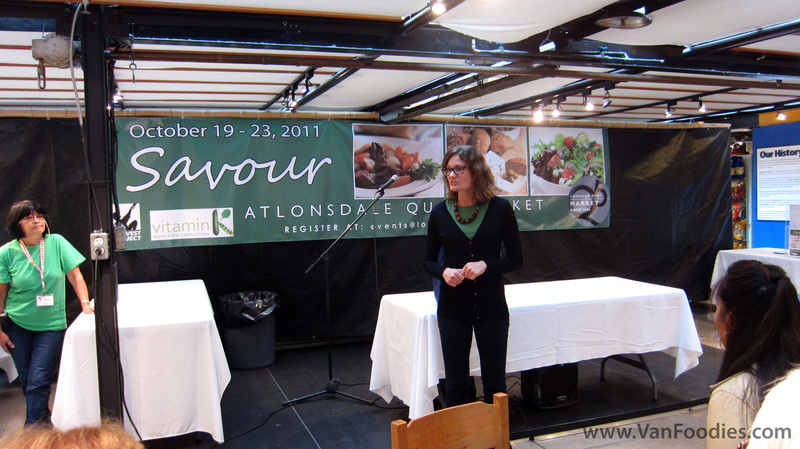 For five days in October, the Lonsdale Quay Market ran a food and beverage festival called Savour. Honestly, we don’t go to the North Shore very often because we live in the suburbs, so we don’t know Lonsdale Quay very well. 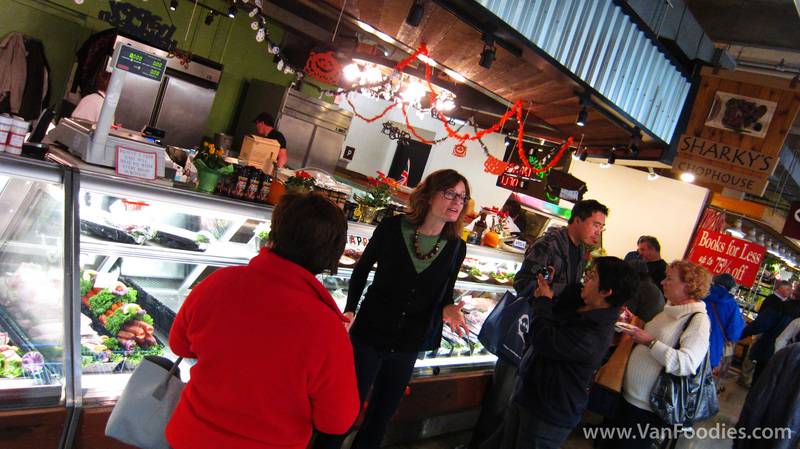 Since the Savour event was free for public to attend, Mr. and I took the opportunity to explore the market. The Soup Meister‘s soups are very light and homey. It’s not super rich and you won’t feel thirsty after having their soups since they don’t add additives or preservatives and the soups are low in sodium. El Dorado‘s pasty is very fluffy, especially the pie crusts and empanadas. Beef empanadas are good. Cilantro & Jalapeno makes their product fresh on-site every morning. I talked to one of the staff, and learned that they hand-cut/chop all their ingredients (think tomatoes and avocado for guacamole, and tomatoes and lots of cilantro for salsa). We tried both the guacamole and salsa with some tortilla chips, and they taste very fresh, as if you are at a party and your host just make them and serve right away. I have to admit, I’m not a salad person so my knowledge about salad stands are limited; but I’ve certainly walked by many of them and my curious mind tends to encourage me to tip my head and check out the ingredients. Waterfront Salad Garden has some really interesting items that you don’t find at every salad stand. 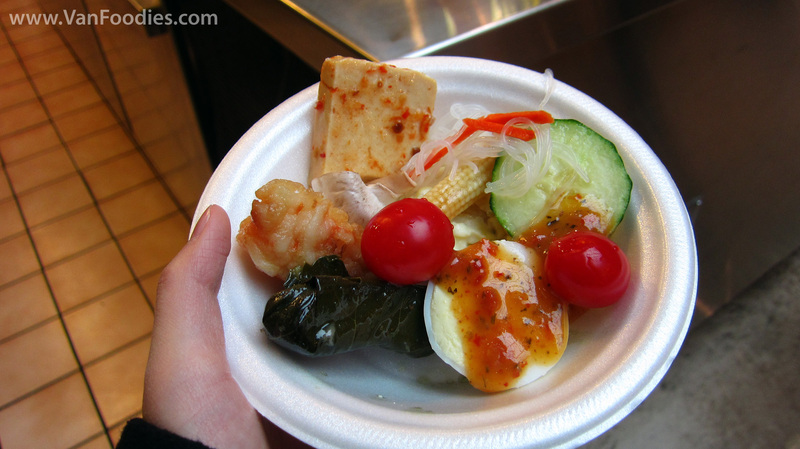 I saw fish product (similar to fish ball, but not quite the same), dolmades, Thai spicy firm tofu, sunomono (the Japanese noodle salad), just to name a few. Kosta the Fishmonger owns both the Salmon Shop and Screaming Mimi’s. He showed us how to select good quality, fresh crabs and lobsters. For crabs, squeeze the legs to test the firmness; the firmer the legs, the fresher the crab is. For lobsters, test the same but instead of the legs, squeeze the neck part. Also, to boil lobsters, make sure to drop them in the pot head first, so it won’t splash water on you (remember that scene in Julie and Julia?) and boil for about 14-15 minutes. Sharky’s Chophouse sells both fresh and cooked meat. We randomly saw people holding some big plates of yummy food, and learned that Sharky’s has lunch specials for $6.95 and the portion size is huge! I tried their corned beef and it’s pretty good. In addition to our samples, which were a lot because we were full after visiting the 7 stores, each of them also generously gave us some goodies to take home. Overall, the impression I got out of this tour is that the Lonsdale Quay Market is not as commercialized as the Granville Island Market. It’s less touristy (despite the fact that Lonsdale Quay is one of the promoted tourist spots), it still gives you the feeling of a local market. The tour is a great event to help people get to know the market, and I love the fact it’s free for everyone to attend (although with limited space). 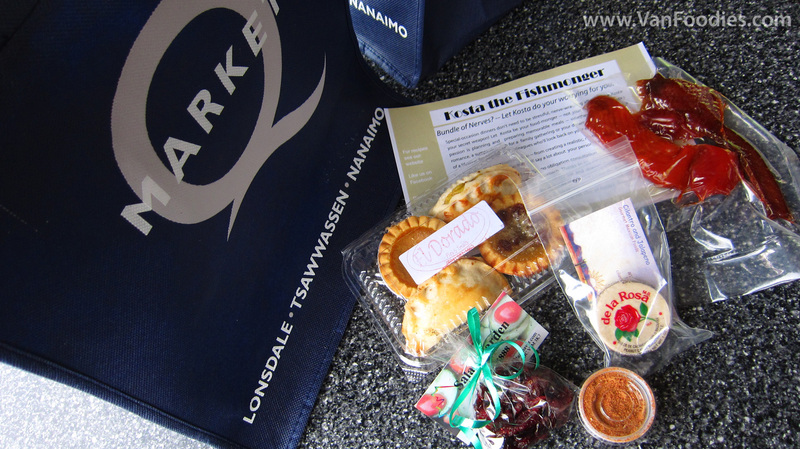 Some of my co-workers who live around there don’t necessarily go to the market often and were jealous that I got to sample so many places (well, they should’ve followed my blog, shouldn’t they?). I’d recommend to my friends if and when they hold it again in the future. Congratulations! Enjoy your GC and please continue to support our blog!